The "Neo's" as they are sometimes nicknamed, have about 100 species and are easily recognized by the absence of a conspicuous flower spike, the foliage compensates for the lack of showy flowers. The species and especially the hybrids display an incredible diversity of leaf colors and patterns. They are found in Brazil, Columbia and Peru. They were named in the 1800's by a Russian Botanist named Edward Von Regal. They grow naturally near the lower levels of the rainforest on fallen trees and on lower branches. Some grow saxicolousy (on rocks) in full sun. 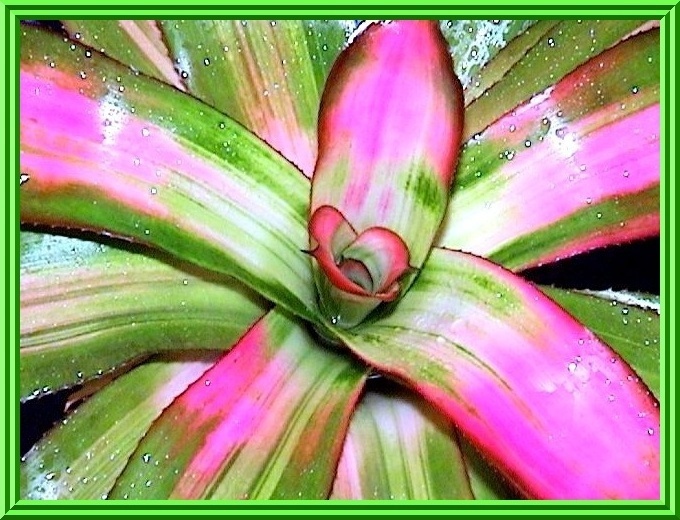 This is my favorite bromeliad, mostly because of the hundreds and hundreds of colors. This is what makes them the leading choice for hybridizers and collectors alike. Neoregelias offset and complement any design... whether inside homes or officies, or outside in the landscape designs of the southern United States. The Inflorescense (flower) is not the main attraction here (my opinion), as much as the forms and colors are. They inflorescense is a rosette shape and stays in the center of the plants cup. Tiny flowers arise out of the rosette and range in colors from blue, white and purple. Size varies from little miniatures, 4 inches in diameter... to as large as 4 feet in diameter. The leaves may be solid green, silver scales (trichomes), banded and blotched, variegated and marbled... spotted, albomarginated, reds, purples, pink and blues. The leaf tips can be pointed, rounded, symmrtrical and spiral in formation. The best way to get good results from cultivating neoregelias is... give them a good start (pups-offsets are best) with slow-release fertilizer (half-strength), and a good... open potting mix (see section on culture). As they grow to maturity, do not fertilize any more. Move them into brighter lighting conditions. 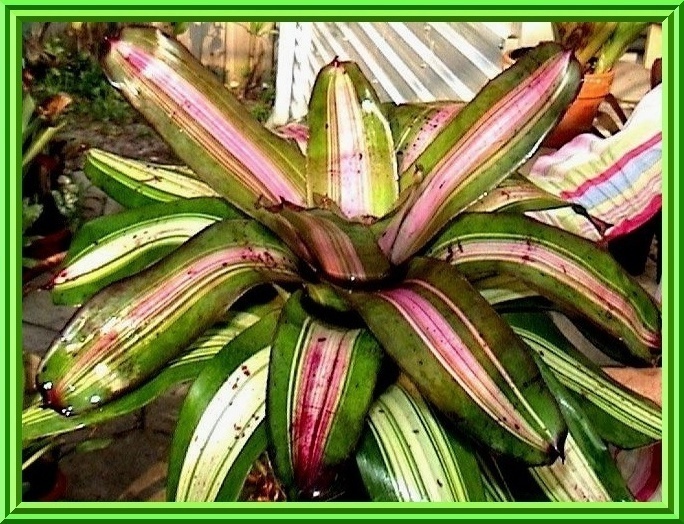 This keeps the plant more compact and realy intensifies the coloring-up of the foliage. Give neoregelias very bright light. At least 3500 footcandles is recommended to produce good foliage color and compact rosettes. 5000 footcandles is better, and some develop their best color in nearly full sun. Outdoors, 30% to 60% shade cloth is best for sunny locations. Variegated types are an exception, give them considerably more shade. Though many neoregelias are hardy down to 20 degrees F. or less, frost protection is recommended. High temperatures do not harm the plants, but foliage color fades when nights are hot. 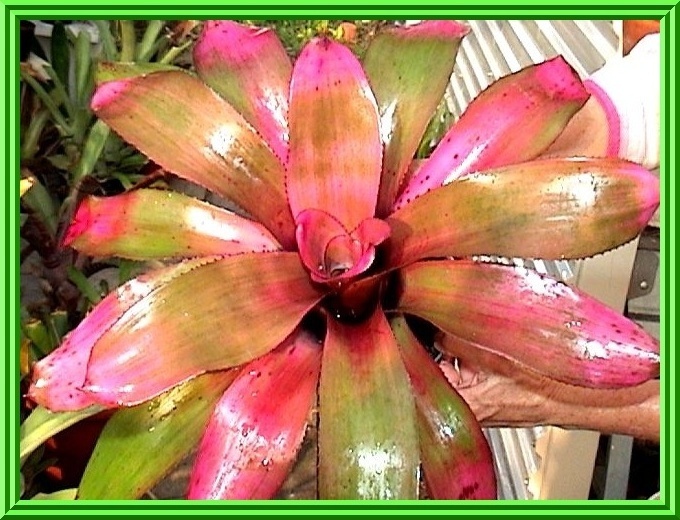 Normal color returns when nighttime temperatures drop to near 65 degrees F.
Follow basic bromeliad culture for potting. Most neoregelias are grown as single plants in order to display their symmetrical rosettes of colorful foliage. Some species do well as mounted specimens, especially the stoloniferous colony-forming ones. Those species are also great for hanging baskets, where numerous generations of plants cascade over the basket several feet. Proper application of fertilizer is crucial for producing good quality neoregelias. Heavy feeding causes colorful foliage to turn green. It also produces large, elongated rosettes that are less attractive than compact ones. In order to grow show-quality neoregelias, maintain them under the same growing conditions throughout their pup-to-bloom cycle. Their beautiful tight symmetry can be ruined by a change in light intensity, light direction, temperature range or feeding. If grown in a window or other location with the light from the side, frequent rotation (at least a quarter turn per week) will keep the rosette upright. 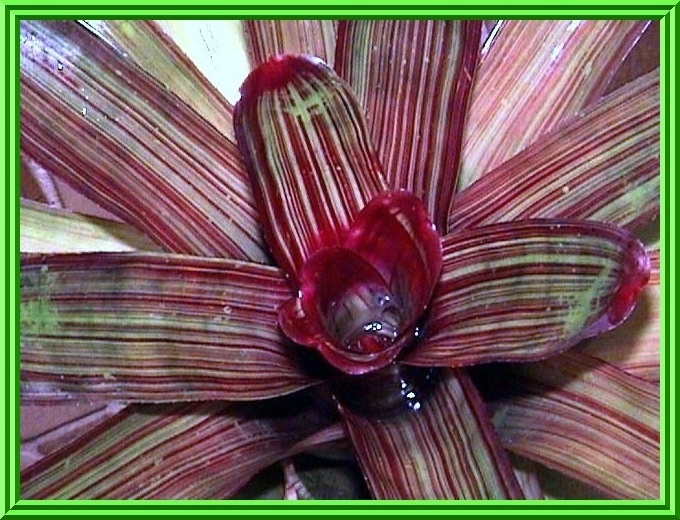 I always have a large assortment of Neoregelia species and hybrids on hand. Should you be interested in purchasing... or even a trade of sorts, drop me an Email to see what's available. I only send offsets through Priority Mail in the United States. All plants are shipped bare-root and properly tagged.